I have read the threads re sending remittance advice when payments are logged, but I don’t seem to have the option to do this on the purchase screen (see below). Am I missing something? 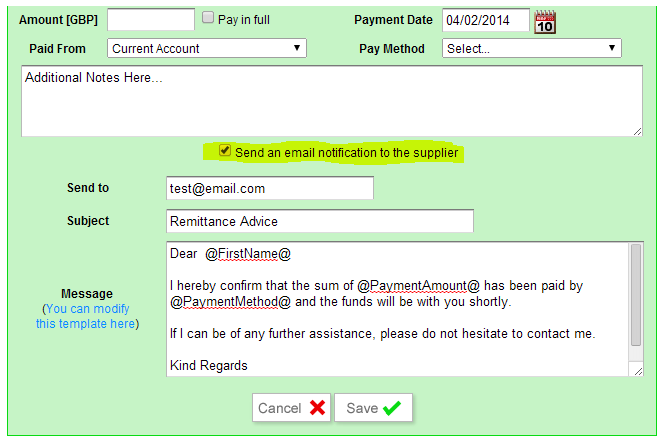 Also, is there a global option to send remittance advice to suppliers with an email address? I believe the option you are talking about is only available when you tag the payment to an invoice? Email receipt of payment from bank tag is this the option you are expecting to see? Does the supplier have an email address saved in the supplier settings page? Yes, included under contact details. I apologies I missed the original screen shot on your opening post. I’m afraid we don’t yet have a way to log the remittance advice along with the purchase invoice when immediately marking as paid. The only way at the moment is to lodge the payment on the preview screen, which provides a few more payment related options. I will convert this to a feature request for now.